New Balance is now ready to introduce their blackout colourway for the Furon and Tekela, while dropping their new Furon 5 boot. Let’s see what New Balance has done with the new Furon 5. Made for all the ballers of the game. The ‘make something out of nothing’ players. 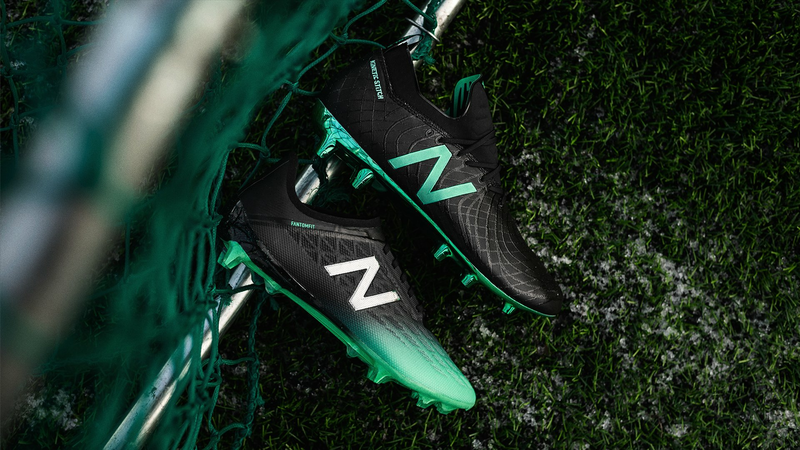 New Balance are ready with their newest Furon 5 boot, made for the unstoppable players of the game, that focusses on fearless creativity and explosive speed. The new blackout colourway is made for the players who wants the spotlight, who controls the game and for the players who vanishes right in front of you. Achieve flare, skill and passion to become the untouchable and unstoppable player. If you’re a sucker for blackout boots, just like me, then spend some time and enjoy these boots. The blackout upper is combined with an awesome green colour, which is a combo that we’re not seeing that often enough. The new Furon 5 isn’t a completely blackout colourway, as it features a green midfoot and toebox, which is completed with an awesome see-through green soleplate. Furon 5 features a high traction toe off area, that help you accelerate even faster than before, while a multi-zonal soleplate helps with a better grip in the surface, which helps you change directions easier. The Furon 5 also comes with the zonal support Fantomfit and Hydraskin touch membrane, that helps with an incredible lockdown, while the cleanlace contact zone helps you achieve a clean strike and deadly finish. Get to learn speed and accuracy better with the new Furon 5. Moving on to control and touch, the Tekela also features the awesome blackout and green combo on the branding. The difference lies in the stunning soleplate, which is a thing that the Tekela is known for. New Balance has started the year out strong with this boot and is your playstyle all about control and fearless creativity, then be sure to pick up this pair of boots. The Tekela is all about an extreme dynamic stability, instant touch, incredible feel and maneuverability, which will help you achieve fearless creativity to control all areas of the game. The Tekela 1 comes with a Micro fiber upper and Kinetic Stich embroidered bands, that gives you the stability and touch that you need to control the game. To help you get the agility that you need, a silicon embossed elasticollar is added, while multi directional studs help you making sharp turn and cuts with the ball setting up the entire team. No matter if you are in for fearless creativity or explosive acceleration, then you can get the from Friday the 18th at 10.00 CET.